In this selection by some of the world's finest poets, Ulick O'Connor has chosen poems that he feels 'could bring a flash to the reader's mind'. Poets selected include those from a wide variety of genres - Irish and non-Irish, household names and the relatively obscure - and Ulick also provides a short paragraph on each poem, its background and author. 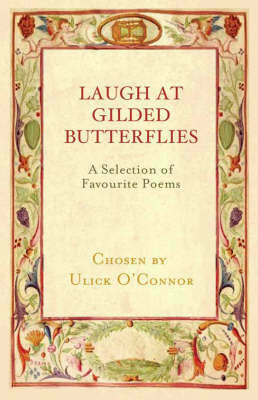 A beautiful gift book, "Laugh at Gilded Butterflies" will be a treasure for any reader of poetry and, as Ulick notes, 'many will experience that special delight brought to mind by a true poem'.Poets to be featured include Mathew Arnold, E.E. Cummings, Alfred Lord Tennyson, W.B. Yeats, Siegfried Sassoon, Oscar Wilde, Robert Front, Eva Gore Booth, Oliver St John Gogarty, Hilaire Belloc, William Wordsworth, Brendan Behan, Gerard Manley Hopkins, D.H. Lawrence, Dorothy Parker, Rupert Brooke, T.S. Eliot, Joseph Campbell, Edgar Allen Poe, Patrick Kavanagh, Dylan Thomas, William Blake, Patrick Pearse, Muhammad Ali, and many others.